Steve Christian is the creator and producer of Local Haunts and Medium in the Raw with Pamela Theresa. Known as The Paranormal Power Couple, Steve Christian and Pamela Theresa created and produced two TV shows, Medium in the Raw and Local Haunts that aired in Jacksonville, Florida on CW17. Medium in the Raw 6 seasons, and Local Haunts for 9 seasons and have been a fan favorite for years. Together Pamela Theresa and Steve Christian work to help those who are guided in their direction to come to the awareness of the existence of the spirit world. Their mission is to present evidence of paranormal activity that is filmed on location during investigations. Local Haunts was featured on the SyFy show Fact or Faked: Paranormal Files, and was proven to be FACT. Local Haunts goes on location to investigate and film evidence of paranormal activity. Apparition at the Florida Theatre captured while filming on location for Local Haunts. Photographic evidence of spirit taken on location while filming for Local Haunts. The mastermind behind Local Haunts, Steve Christian has an extensive background in television production. 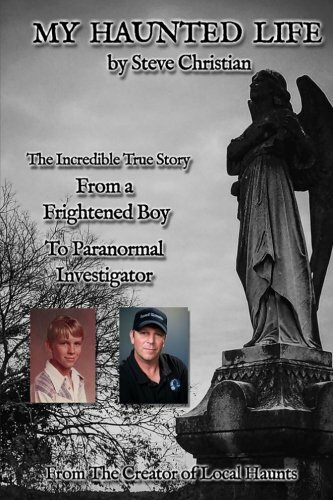 His lifelong passion for the paranormal was a natural fit to combine his interest with his work experience. Steve came up with the idea of Local Haunts in 1991 but had to sit on the idea until the world was ready. And launched the show in 2010 to an eager audience that became instant fans that have followed the show ever since. Known as Medium in the Raw, Pamela Theresa is a true medium helping those dealing with tragic loss and repercussions of death delivering powerful evidence of spirit communication while teaching how to continue the everlasting communication without the medium. She joined the Local Haunts team in 2012. Savannah has been a Local Haunts Team member since 2013. She is the Daughter of Pamela Theresa. She started as camera operator and has since found her way to the other side of the lens. She is a Paramedic is a student at the Fire Academy of the South . She is a gifted artist, and is also a Horse Riding Instructor for beginner to intermediate in English Pleasure. And has stable management experience of 5 years. Syfy's Fact or Faked tries to debunk the Local Haunts Florida Theatre apparition. My Haunted Life V2 | WHY DO GHOSTS HAUNT? My Haunted Life V. 1 . | HELP! My House is Haunted! Join our Spiritual Social Network! LEGAL DISCLAIMER: ALL CONTENT ON LOCALHAUNTS.SHOW IS FOR ENTERTAINMENT PURPOSES ONLY.